To sign up for the camp, click on this caption. 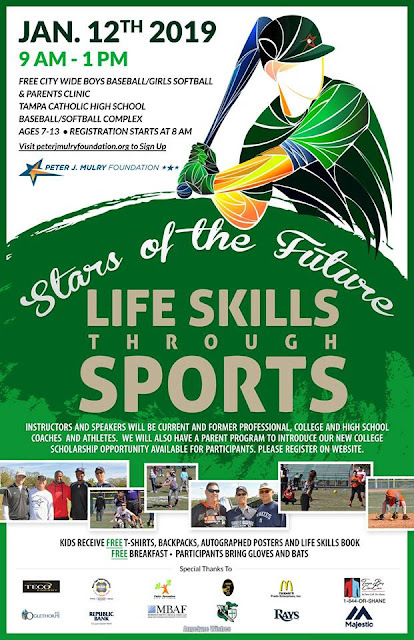 TAMPA - The Peter J. Mulry Foundation will again host its Stars of the Futures Clinic for baseball and softball players 7-to-13 years of age at Tampa Catholic High School, on January 12, 2019. The event, which is free to all athletes will run from 9 a.m. to 1 p.m., with notable area coaches from the professional, college and high school ranks. Registration begins at 8 a.m. and each player will be provided with a free breakfast, backpack and shirt by the foundation. Players need only bring gloves and bats, and parents are strongly encouraged to stay and participate. The parents portion of the clinic will include something new this time around, as the Mulry Foundation has partnered with ACES Nation, to offer a college scholarship to a clinic participant. Follow the link at the end of this story to sign up for the clinic. With a focus on teaching life skills through athletics the Peter J. Mulry Foundation’s goal is to start young players on a path to success on and off the field, according to Mulry, the founder and four-time Florida High School Athletic Association state champion coach at Tampa Catholic. Mulry, who led the Crusaders program from the late 1960s through 1978, before spending five seasons as the head coach at the University of Tampa, started his foundation after retiring from coaching and beginning a second career in real estate in the Pensacola area. January’s event will mark the 18th clinic the program has hosted, and it’s sixth one since Mulry returned to the Tampa area. The event will also include an autograph session after the clinic, where the attendees will be able to collect signatures from the instructors from the ranks of professional and college levels. Mulry, who also published a book in 2011 entitled “Conversations in the Seventh Inning of My Life”, interviewing 30 of his former players about the life skills learned will competing for him at the high school level, has seen the continued growth of his foundation as an extension of a coaching career that he takes tremendous pride in. And for Mulry, one of the biggest things athletics teaches people, especially at the youth level is inclusion, another big emphasis of the foundation and its clinics. To sign up for the clinic, please Click Here and follow the link at the top of the page that reads: “Register for Stars of the Future”.